South Korean rescue teams found 48 bodies in a single cabin on the Sewol ferry meant to accommodate 38 people, officials say. The group was crammed into a dormitory and all were wearing lifejackets, a South Korean Navy officer said. Some 183 bodies have been recovered from the Sewol, but scores of people are missing, presumed drowned. The head of the operation to retrieve bodies said on Friday he had “no idea” how long the ship search would take. There were 476 people on board, with many trapped inside as the ferry listed and sank within two hours of distress signals being sent. A total of 174 passengers were rescued. Many of those who died or are presumed dead were students and teachers from Danwon high school, south of Seoul. Furious relatives attacked the speed of the recovery operation on Friday in a confrontation with the fisheries minister and the coastguard chief. 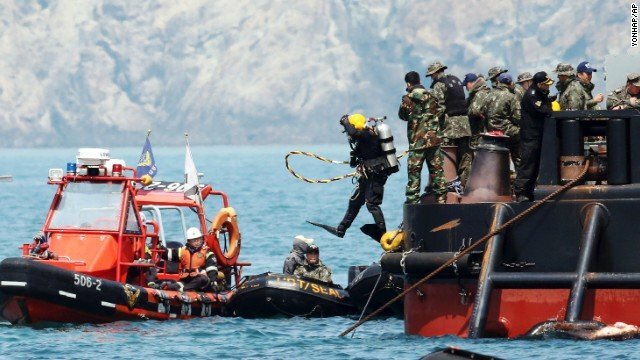 In a briefing to reporters on the southern island of Jindo, Navy Captain Kim Jin-Hwang described the difficult conditions that the divers were facing. He said one group had found the single dormitory room filled with the bodies of 48 students wearing lifejackets. The presence of so many victims in the cabin suggested many had run into the room when the ship tilted, correspondents said. Retrieving the bodies was far harder than finding them, he said, with divers unable to spend much longer than 10 minutes inside the ship at a time. Officials said rescuers are retrieving around 30 bodies a day but the bereaved families have demanded that all remaining bodies are removed from the ferry before the weekend. Search officials said just 35 of the 111 rooms had been searched so far. The South Korean government says it is “mobilizing all available resources” towards the rescue effort but bad weather and stronger currents due on Saturday and Sunday are expected to hamper their efforts. Prosecutors are said to be investigating whether modifications made to the ferry made it more unstable. Factors under consideration include a turn made around the time the ship began to list, as well as wind, ocean currents and the freight it was carrying. Reports have emerged indicating that the ship’s sleeping cabins were refitted some time between 2012 and 2013, which experts say may have inadvertently affected the balance of the boat.